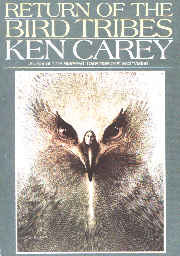 By Author of "Starseed Transmissions"
Ken Carey is the author of "Starseed Transmissions" which conveyed a vast image of the direction of humanity in its migration to the stars. That we are the Star Seed ourselves was its point. Carey writes "Return of the Bird Tribes" Carey, after spending seven years living off the land in rural Missouri (with his only acquiescence to technology being a kerosene lamp - he gives the aura of considering kerosene to be a 'natural' product rather than the end-product of a complex refining process). Thus purified by his isolation and his imagination, he describes via a spirit channel (American Indian, of course) how the world has evolved into warrior tribes around the Mediterranean Sea and into peaceful nations of tribes in North and South America. His story of how Hiawatha and his friend tame the dreaded hatchet-murderer is a gem. A beautiful and insightful story of taming the beast in the warrior. His descriptions of the goals of humankind are alone worth the price of the paperback ($11.95), although you must wait for the last five percent of the book to encounter them. Reading this book has brought home to me a realization about channeling and ideas. No matter how far-ranging and all-encompassing the spirit guides seem to be (20 Billion years old this one), they cannot seem to create new ideas or to encounter ideas that are not already in the literature. Each time I encounter a writer with broad, pervasive visions of the future, they touch on the importance of cooperation, but fall into the history-long trap of assuming that means that hierarchical bureaucracies must be the agents of the cooperation they envision. They are not able to make out or discover (in spite of their averred omniscience and omnipresence) the simple definition of freedom and the essence of true government as created and elaborated on by Dr. Galambos in his volitional science seminars. This very process confirms the teachings of Dr. Galambos. Without a single persons's freely shared idea the world may never progress into some specific area of evolution, e. g., No Wright Brothers, no Pan Am Airlines; no Nikola Tesla, no AC power stations; and no Galambos, no Natural Society (and no understanding of the process just described).